I confess I often choose beer because of the label. Despite my ambivalence about Dark Star Brewery (named after a Grateful Dead song, the best-titled Dead song, but still…) I bought this beer because of the label. It’s pretty. I have tried a couple disappointing Dark Star brews on tap at the Whole Foods “pub”– which now closes at 5pm– is it not part of the green lifestyle to drink after 5pm now? I digress! Could Dark Star redeem itself with my favourite style? And I wondered: can hippies brew an Imperial Stout, the corsair of beers? This question pressed on me until I purchased a (rather expensive) bottle from the same Whole Foods. My heart sinks a bit when I pour it– there’s no head at all, not even a lace of foam ringing the glass. It seems a bit, well, dead. The color is a dark ruby, not quite the black-night-of-the-soul I was hoping for. Plus, it has a soy nose and is sour and bitter at the middle and finish. I keep waiting as it warms in my glass for the chocolate or the malt to show, but I am stood up. This tastes more like an unripe old ale– similar to the savoury/sweet contradictions of Theakston’s Old Peculiar, but without the paradoxical depth. It says on the label that this beer is bottle conditioned and it “will continue to improve for many years.” Maybe this beer wasn’t ready for me? I certainly wasn’t ready for it. 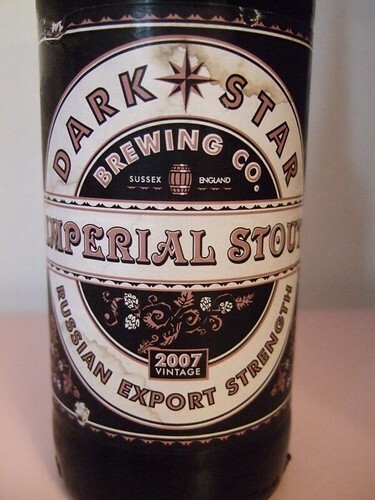 The only similarity between this and other imperial porters I’ve tried– North Coast Old Rasputin being the favourite– is the alcohol content. At 10.5%, chances are when I am done with this one I won’t care too much that it wasn’t that tall, dark Baltic I was dreaming of. I’ll just be happy it did the job. Eats: chocolate covered hazelnuts to make up for what the beer lacked. This pint came with a crash course in West Country History. 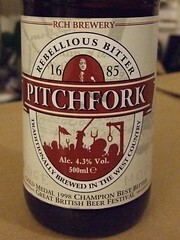 RCH Pitchfork Rebellious Bitter, named after the Pitchfork Rebellion, or Monmouth Rebellion of 1685, was the best of a tasty group of locally brewed beers we tried with my friend Camilla while visiting her in Somerset. While we shared it Camilla told us of the uprising of local farmers, non-conformists and Protestants who wanted to overthrow the “papist” king, James II. Many of the supporters were executed most brutally in the “Bloody Assizes” of Judge Jeffreys. The first to go, burned at the stake, was Alice Lisle. Despite this particularly dark history, this beer was bright and sunny. I pictured myself drinking this somewhere off the oldest engineered roadway, the Sweet Track in the Somerset Levels– an area that was once an inland sea surrounding the mythic isle of Avalon. It would be a new Spring day where the grass had, in in more recent history, worked the bloodshed, the bodies piled high, into itself. Beer is never very far from death, being itself a fermented thing, but I digress. Pitchfork was bottle conditioned; the cloudy sediment in my glass settling at the bottom gave the beer a refreshing and whole presence. It had a citrus-weiss front, a floral hop middle with a dry closure and some pleasantly lingering bitterness. Camilla said it reminded her of Indian beer, and it shared a resemblance to excellent IPAs I’ve tried. To say that each glass of beer is full of history, or that England’s story is older than the national identity of the U.S. would be cliche. I wouldn’t say I drink beer looking for a past. Many American tourists do come to the UK looking for ancestral roots and this is just the solipsistic version of looking for a history. But while drinking a pint, sometimes history finds you. While listening to: Melvins, At the Stake. Many Brits I have met are under the misconception that the only beer available in America is lager, simply because this it what is exported to the UK. While Americans do drink other kinds of beers, these beers tend to be chilled. The first thing I had to get used to drinking beer (and soda and water) in the UK was that it was often warm. 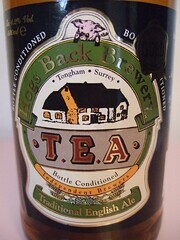 Hogs Back Brewery’s Traditional English Ale is bottle conditioned, meaning the yeast is still active in the beer, and part of the fermentation takes place in the bottle. It is considered “live”– resembling real ale in the cask. The label clearly states “Do not refridgerate” and suggests a serving temperature of 55 degrees Fahrenheit. In California, where I am from, this would probably require chilling of some sort but in England it’s room temperature. I was skeptical, being a beer-cheat in this one regard. I chill most beers I drink. But maybe it was the cute little pig on the label, or more likely that I was cold from carrying my beer haul home under the ominous grey skies, and I was getting my head around the idea of a warm pint. And it was without a doubt a revelation. This ale presents you with a full-on toasted nose, a rounded malt middle with a light caramel warmth. Undoubtedly it is this delicate sweetness that would be lost first with chilling, the most charming note. Despite its subtle complexities, it’s balanced and easy to drink, even “warm” (says this American palate). T.E.A., like it’s namesake that other English beverage, is a come-in-from-the-rain, a welcoming sort of drink. It seems to say, Don’t worry, you’ll dry. With: springy Comte cheese on an oat biscuit with a smoosh of avocado.